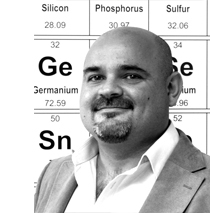 Jose A. Lopez-Sanchez (JALS) is Professor in the Stephenson Institute for Renewable Energy (SIRE) in the Chemistry Department of the University of Liverpool where he is leading a research group in the area of catalysis and the transformation of biomass to chemicals. With a degree in Industrial Chemistry from U.R.V (Tarragona, Spain) and after undergraduate jobs in the petrochemical (Dow Chemical, Spain) and coating industry (Tricon, Germany) he obtained his PhD in Heterogeneous Catalysis in Cardiff University (2003) with Prof. G.J. Hutchings. After research positions in the Universities of Salerno (Italy), Glasgow and Cardiff he is, since July 2011, leading his own research group in Liverpool. With a background that includes polymer, packaging and industrial chemistry, JALS has over 15 years expertise in applied catalysis and particularly in the development of heterogeneous catalysts such as supported nanoparticles and porous materials for a variety of reactions of industrial application and academic interest. Recently, JALS has developed a number of heterogeneous catalysts for upgrading biomass-derived chemicals. JALS has written over 60 papers, 7 patents and has attracted funding via research councils and industrial partners, including a ca. £2M EPSRC proposal for the development of biorenewables via high-throughput methods. His research is currently focused in the development of Catalysis for Biomass transformations, Energy, Photocatalysis and Nanostructured Materials for Catalysis. Additionally, JALS is director of an open-access MicroBioRefinary facility within the Chemistry Department. The MicroBioRefinary is a facility co-funded by the Regional Growth Fund and industrial partners aiming to develop bio-derived alternatives to petrochemical feedstock's. JALS is also academic leader in Sustainabililty in the new Materials Innovation Factory.